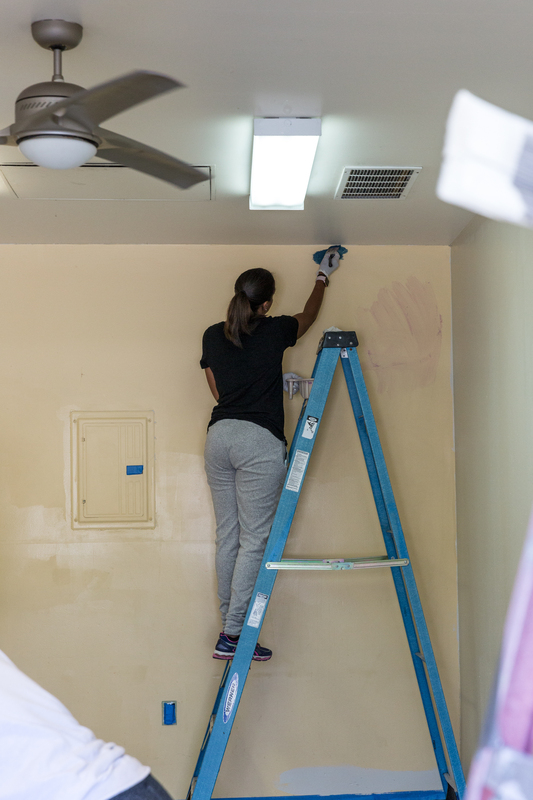 We have started a nonprofit organization, Joy By Design, to provide the same services that we provide to our wonderful clients to those that are less fortunate. 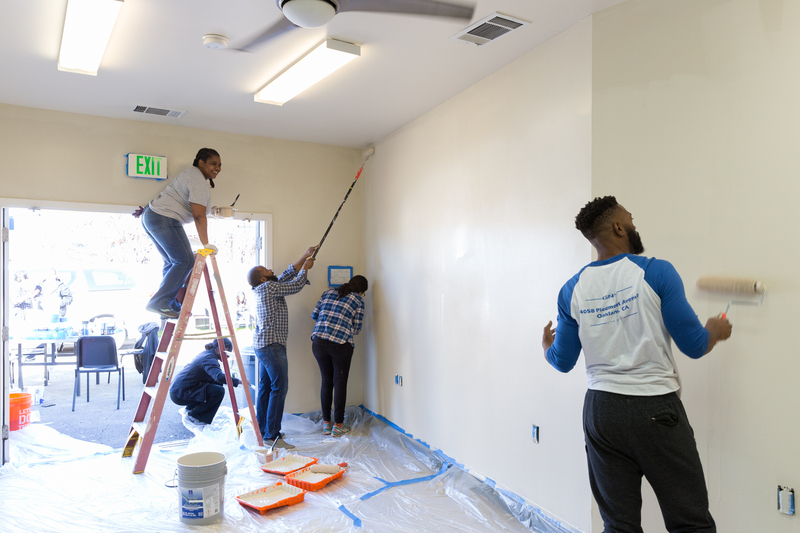 Our mission for Joy By Design is to provide interior design services and transform office and living environments for other local Bay Area nonprofit organizations and individuals. To learn more about the mission and purpose of Joy By Design, click here. 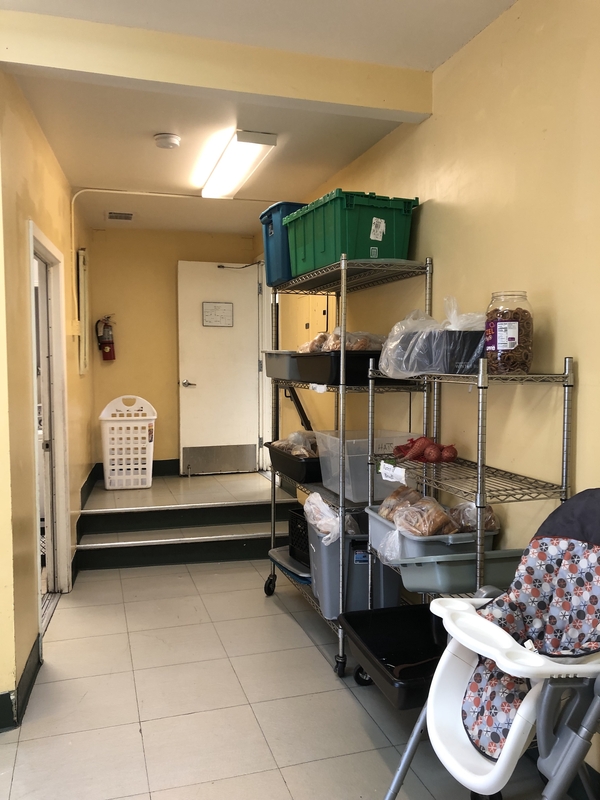 On January 21, 2019, Joy By Design (JBD) had its inaugural project working with Ruby's Place. 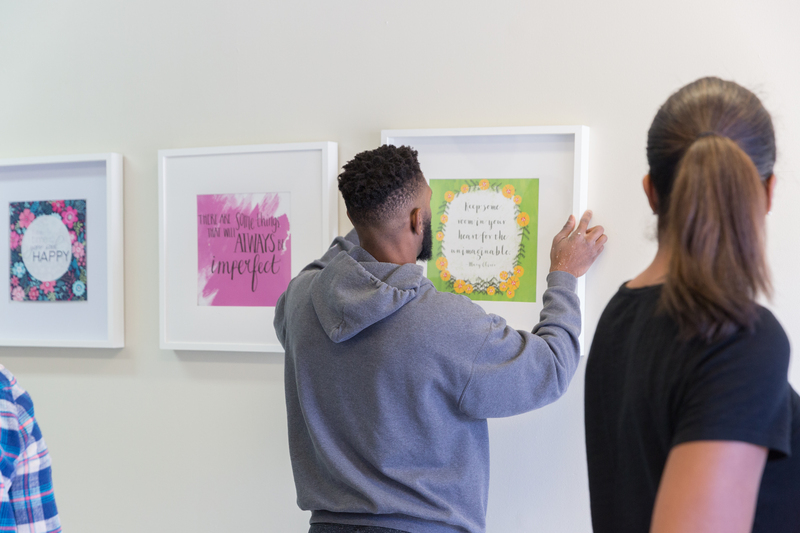 Ruby's Place is a non-profit agency in the Bay Area providing shelter and support services since 1972 for families and individuals who experience domestic violence and human trafficking, including, but not limited to, the African-American population in Oakland and the surround Bay Area. 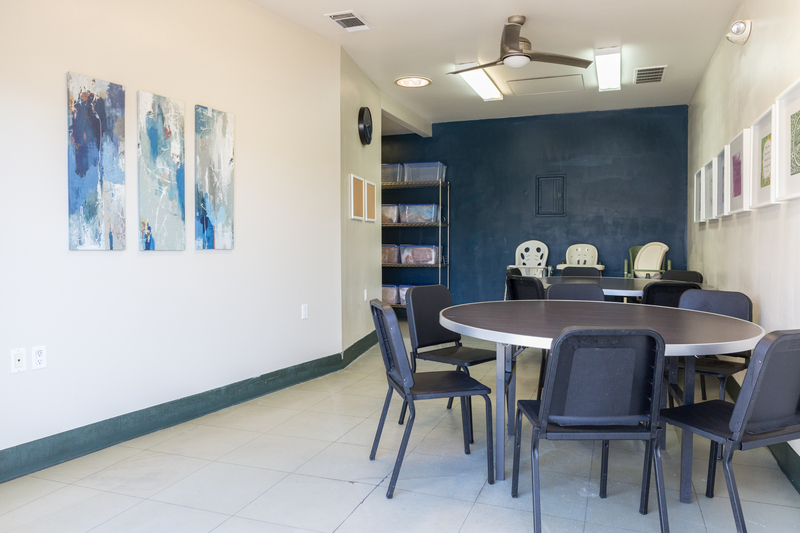 To learn more about Ruby's Place, click here. 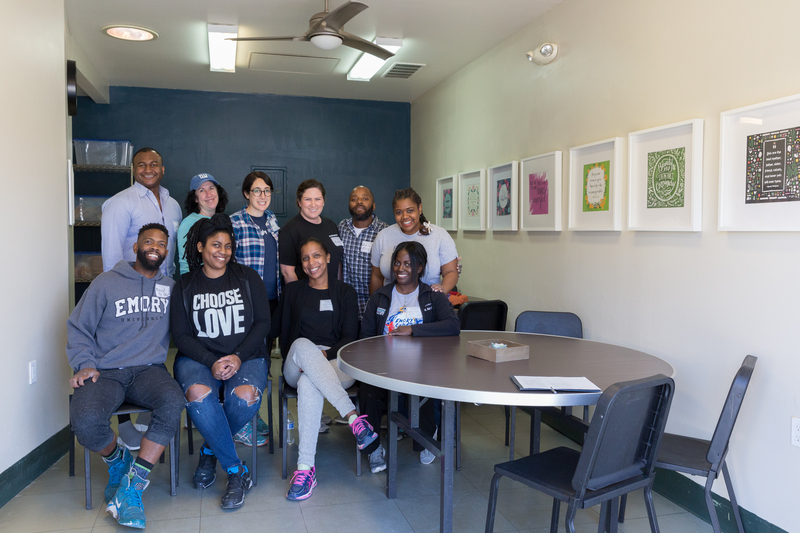 As an initiative of our black interior design studio, JBD partnered with one of Emory University's CEBA (Caucus of Emory Black Alumni) chapters. 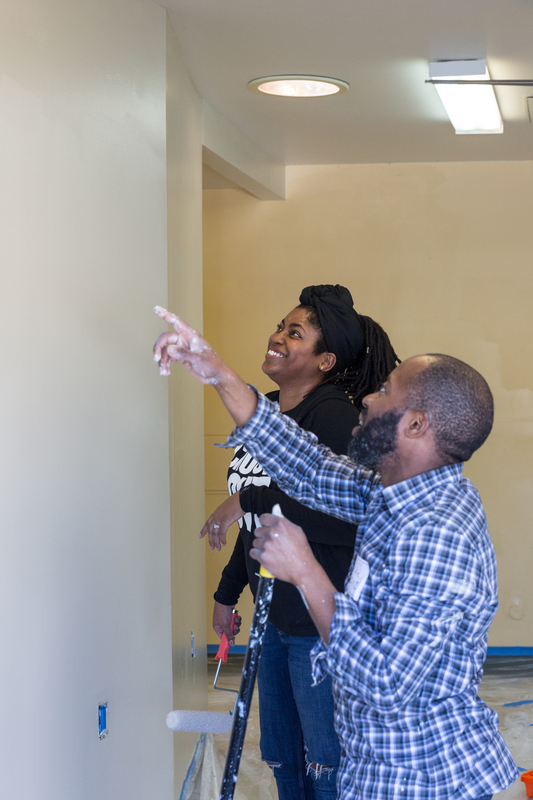 We had 12 volunteers that assisted in cleaning, painting, and decorating the dining room. Before, the dining room's yellow walls needed an updated look, especially with the recent repair on the left wall. 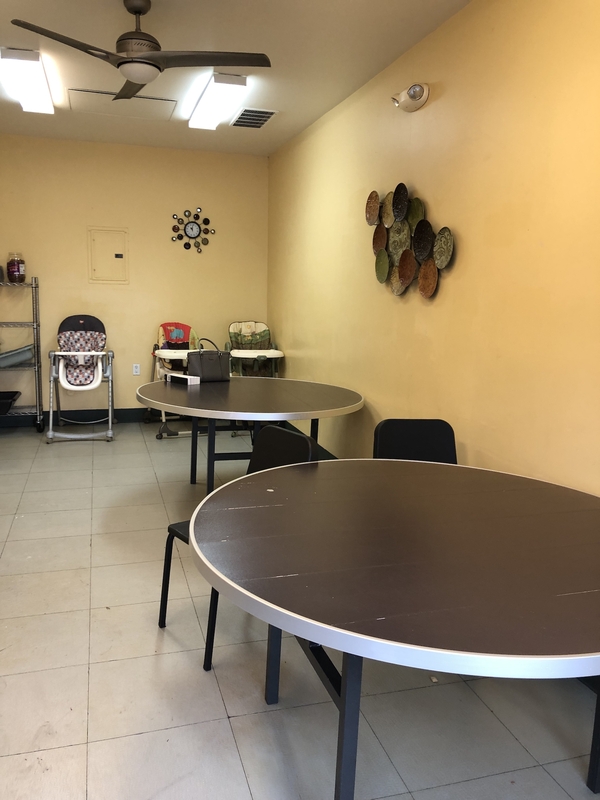 This dining room is used daily by 42 women and children. 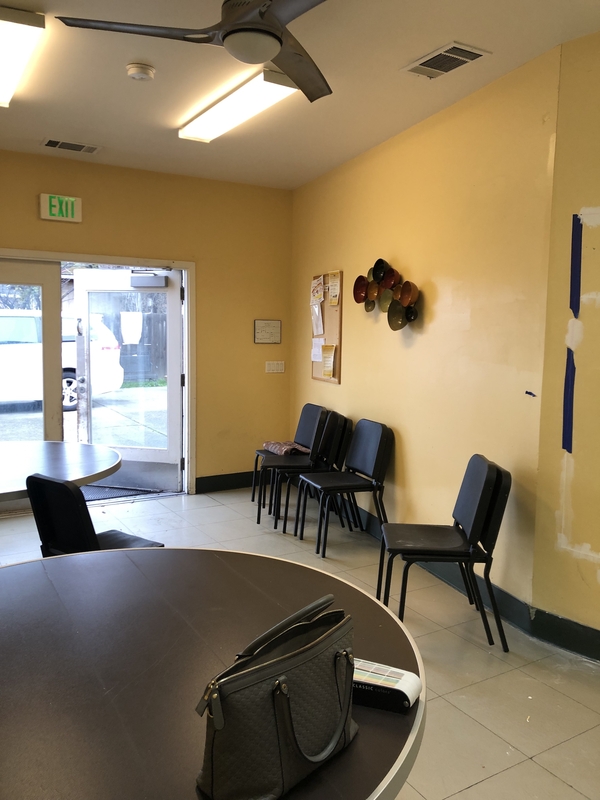 The french doors are the main entrance into the space, with this high traffic area, a fresh coat of paint on the trim and the doors was a must. The hallway between the dining room and the kitchen is also used for food storage. The containers were mismatch and many containers did not have proper lids. Another goal for the space was to give the artwork a modern update. 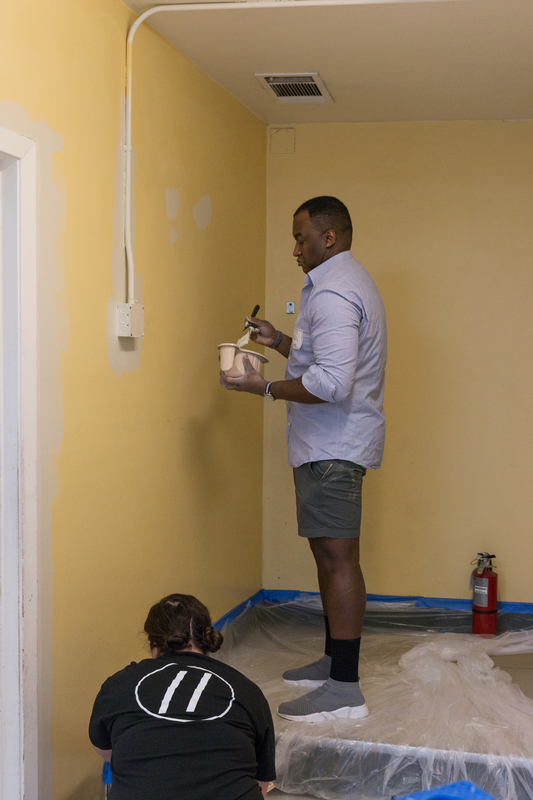 A fresh coat of paint in the dining room was the main task at hand. 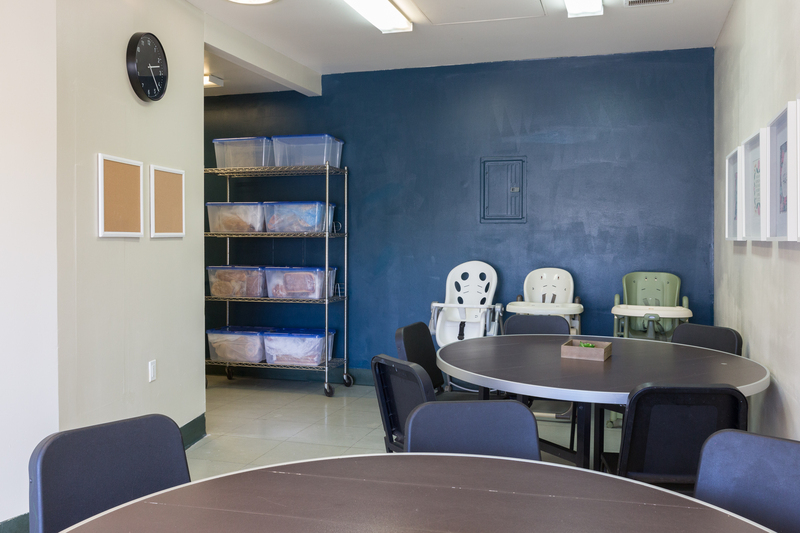 A big shout out to Sherwin-Williams for their generous donation of paint for the space. The trim and doors were painted Extra White SW-7006. The main dining room walls were painted a beautiful and neutral greige (beige+grey), Grecian Ivory SW-7541. The accent wall that expands in the dining room and down the hall was painted a rich blue-green called Rainstorm SW-6230. 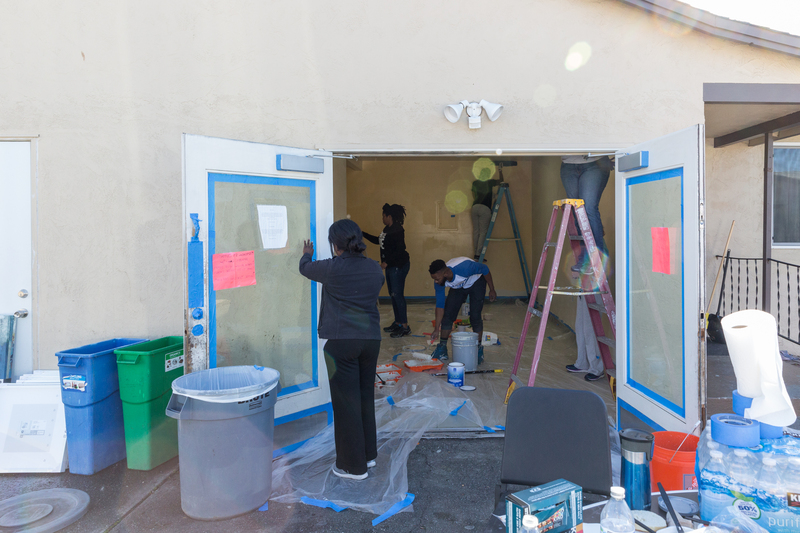 The volunteers were hard at work to transform the space within just a few hours. 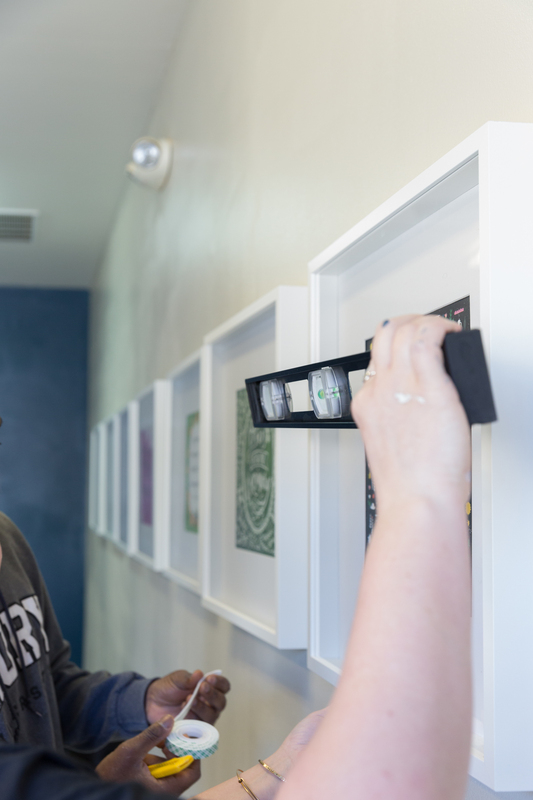 We wanted to update the art and make a statement piece, so we choose to hang 7 white frames along the largest wall of the room. We knew we wanted to make the space unique but also uplifting, so we went with encouraging quotes. Fun fact: We used calendars that had beautiful art and quotes to fit into the frames. A few other items were added to the space. 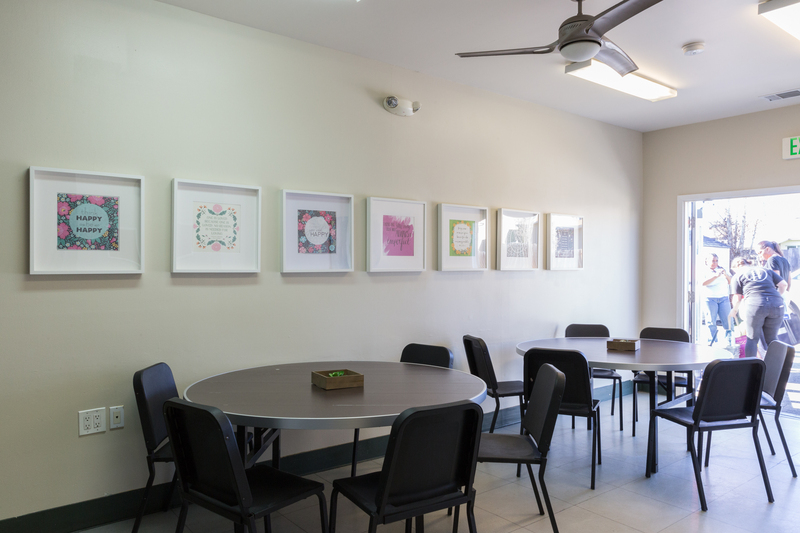 A modern clock and two small bulletin boards were hung on the angled wall. We also purchased new coordinating storage containers with lids and added a plastic pocket on the outside so that a label could be slipped into the pocket for organizing. 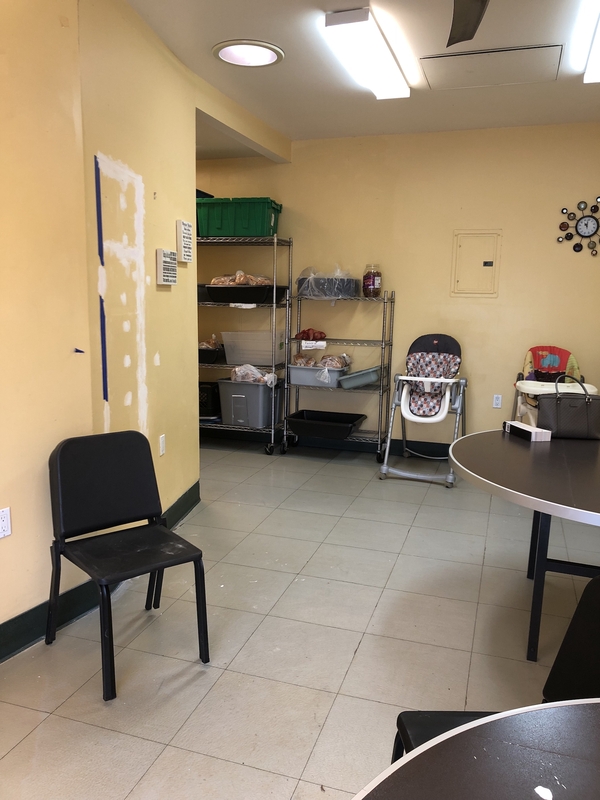 We are so thankful for the opportunity to bless Ruby's Place with a new and updated dining room, for all the volunteers who gave up their time and skills, and to Sherwin-Williams for their generous donation. And another big thank you to Lauren Edith Anderson for donating her time and photography skills.